(Jakarta, 11/23/15) Radio Republic of Indonesia (RRI) takes the lead in celebrating the World Tolerance Day 2015. 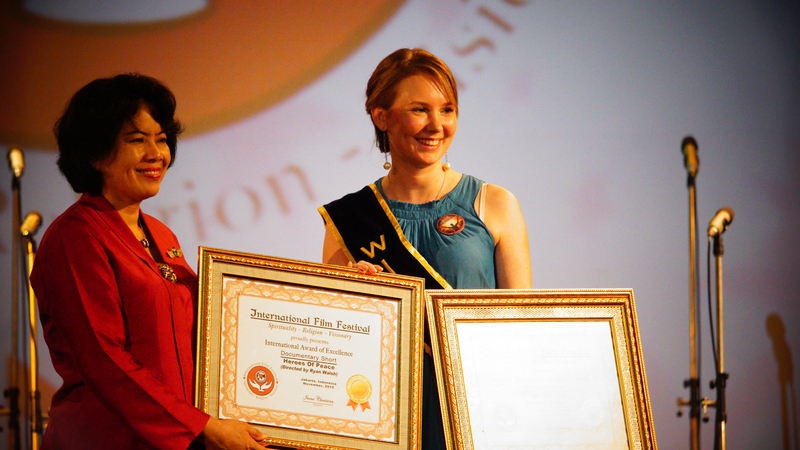 Chairman of RRI, Rosarita Niken Widiastuti, presents the awards to the international filmmakers who attended the Awards Ceremony of International Film Festival in Jakarta, Indonesia. International Film Festivals is an international film festival with Jakarta as its main based and received films from all over the world and for November, this festival focuses on films with tolerance theme. Rosarita Niken Widiastuti opened the Awards Ceremony that was held in the main Auditorium of RRI recently as part of World Tolerance Day. “We keep hearing news about women, children and innocent people being killed because of intolerance. This shows that the world needs many figures to fight for tolerance.” said Niken during her opening speech. After delivering such an amazing speech, Niken also presented the winning awards to Ryan Walsh from Austrailia who received awards from International Film Festival For Sprituality, Religion and Visionary (IFFSRV) for his film Heroes of Peace. Heroes of Peace is a short-film that tells a story about war veterans who thought they would never feel joy again but finally find happiness. The winner of Best Film of IFFSRV is Pilgrimage directed by Mariel McEwan, who receive Production Fellow from American Film Institute. Pilgrimage is a beautiful and unique piece of film that mix dances and spirituality of balance. This film brings the audience to see the nature beauty of Sawtooth Botanical Garden. IFFSRV works together with other International Festivals like Filmmakers Of The Year Film Festival (FOTY), International Film Festival for Documentary, Short and Comedy (IFFDSC), International Performing Arts and Movie Awards (IPAMA) and International Students and Newcomer (ISENMA) and held by The Indonesian People’s Creative Council, iHebat International Volunteers, The University of Indonesia, Care for Children Foundation, World Film Council, several High Schools and Radio Republic of Indonesia (RRI) as media partner and organiser.